Confident Innocence And Uncomprehending Sincerity Will Lead Us To State Capitalism. The democratic nation state is always moving towards totalitarianism. There is no movement in the opposite direction. So said Anthony de Jasay in The State. The State’s Goal Is Power. He arrives at this somewhat depressing conclusion via an interesting route. He starts his inquiry with a question for all of us: What would you do if you were the State? This is not a book that worries about the origin of the State, or about its violence, theft and coercion, or whether there is a social contract. It tries to see the world from the State’s point of view. The State has ends, or goals, just as we all do. After weighing up various alternatives as to what those might be, the author isolates one. The State’s end is power. A Lot Of Power Is Used Up In Churning Benefits For Competing Interest Groups. In a democratic set-up, the State is required to organize periodic electoral voting to maintain the pretense of the consent of the governed. Since they feel that the narrative of consent is important for their continued retention of power, they work hard at this task. Whichever of the State’s political parties has its hands on the levers at any point in time attempts a balanced bribery that promises benefits to sufficient interest group members to make them think they’ll get more than others, to the point of a 50.1% voting majority. De Jasay shows how, over time, the confiscation and redistribution math of the two parties becomes almost identical, and the 50.1% can oscillate from one party to the other, while the State remains in power at all times. In fact, there is as much churn as there is redistribution. The old are bribed with health care services and social security while the young are bribed with free or subsidized education, the workers get higher wages and benefits and the managers get infrastructure and government contracts, and the whole pudding just gets bigger and bigger. In fact, the redistribution math becomes a burden for the State. The interest group recipients are never satisfied and keep demanding more. There turns out to be some democratic limits on the amount of economic production the State can comfortably confiscate before the populace becomes morose, sullen and potentially turbulent. The State, while becoming bigger and bigger as it pokes its fingers into more and more parts of the economy to keep the churn going, realizes at some point that it is spending all its effort on maintaining power, and none on what de Jasay calls discretionary power. After entitlements, there is no money left over for nation building, fighting foreign wars, landing on the moon and building grandiose buildings and monuments in the state capital. Lest you should think this is all too cynical, de Jasay allows for the possibility that the State wants to use its power to help people and make their lives better. Even if they do, however, the same trends are going to bring them to the point we have now reached. The level of confiscation is hitting a ceiling, the redistribution funds are being eaten up in ever-growing entitlements, the State is hamstrung in funding its discretionary projects, and the people are becoming morose. Even If Sincere, The State Will Become Frustrated With Its Burdens. Worse, because of a lack of knowledge, intelligence and capability, many of the schemes the State devises to bribe the interest group voters go wrong. There are unintended consequences. There are economic busts, failed investments, and shoddy execution of what should have been magnificent programs. Think Green New Deal. Why such failure? This is where de Jasay introduces “confident innocence and uncomprehending sincerity”. People like Alexandria Ocasio-Cortez may be as innocent and as sincere as they claim to be, but their statist schemes are going to fall afoul of economic realities. At some point, the State has a decision to make. The problem is clearly that political power resides with them but economic power does not. They can confiscate the fruits of production but they can’t produce. They can control the use of assets to some extent, but they don’t own them so their control has a limit. How long will they put up with this? They will tolerate it up to the point where their entire effort is spent on maintaining power and there is virtually no discretionary power left to them. In America, that point is fast approaching. There’s Only One Place To Go. So what happens next? State Capitalism. That’s the term de Jasay uses, although the rest of us might call it Socialism. The State must take ownership of the privately held capital assets if they are to progress any further – if power is to mean anything other than the drudgery of maintaining the entitlements of a morose and increasingly turbulent citizenry. There’s no glory in that. The State must take ownership of energy assets if it is to be able to pursue the glorious and progressive pathway to a carbon-free world. It must take ownership of cyber assets if it is to apply artificial intelligence and machine learning to develop a surveillance-based social credit system to ensure all the citizens behave the way they should. The State must take ownership of transportation assets if the right allocation of usage is to be achieved between bicycles and cars and buses and airplanes. The state must take ownership of financial assets if pesky booms and busts are to be managed and hedge fund owners are to be cut off as a source of competitive economic power. We are not there yet. But it’s coming. The movement is in one direction, and it never reverses. Confident innocence and uncomprehending sincerity will accelerate it. Government Is Structured To Get Bigger And Bigger, And There’s Nothing To Stop It. ‘What would you do if you were the state?” So begins the greatest book of political theory you never read. “The State,” by the Hungarian-born economist Anthony de Jasay, was published in 1985 and has been kept in print by the Liberty Fund, a classical-liberal foundation in Indianapolis. Jasay, who died Jan. 23 at 95, was a gentleman scholar. He fled the communist bloc at age 23 to complete his education in Australia and later at Cambridge. After a career in finance, he returned to his academic pursuits, settling in Normandy, France, in 1979. There he wrote nine books, including a collection of essays. “The State” caught the attention of Nobel laureate James M. Buchanan, who appreciated its “flint-hard” analysis and gave it a laudatory review in the journal Public Choice. “The State” challenges some long-held certainties about politics and economics. Western societies tend to believe that elections matter, and citizens spend a lot of time debating the relative merits of being governed from the right or the left. Lately that debate has morphed into a contest between elites and populists. Jasay argued that particular leaders matter far less than might be supposed and that all governments ultimately seek to maximize their discretionary power. That might seem like too sweeping a generalization, but consider how economists think about businesses. A corporation is a complex human venture. Managers and stockholders may have conflicting interests. Individuals within the company can have a large effect on its direction, particularly in smaller or younger firms. Still, most economists rightly assume that every company’s goal is to maximize profits. It is a simplification, but a useful one for understanding the decisions businesses make. Similar simplifications apply to the study of governments. Bureaucracies are hardly homogenous. Different groups may fight for resources and power. Politicians differ, sometimes sharply, in ideas and character. But governments—like businesses—have basic structural tendencies. The state always seeks to expand. Redistribution, Jasay maintained, is “addictive.” The moment government starts giving out goodies, the mechanisms undergirding society and the economy change. Corporations and interest groups have a new incentive to work to win the state’s favor. So businesses tend to shift resources and attention from engineers to lawyers, from serving customers to capturing decision makers. “The greater the reach of the state, the greater is the scope for profiting from its commands,” Jasay wrote. While free riders usually meet disapproval in markets and social settings—party crashers get thrown out, and companies work to close profit-losing loopholes—they serve politicians just fine. When you’re looking for votes, handouts are an easy way to get them. And the more pervasive the government, the harder it is for voters to notice new entitlements or the costs they impose. “When another ‘free rider’ is allowed to come on board, the ‘paying passengers’ have every chance of remaining oblivious of the fact, as well as of its incidence on the ‘fares’ they have to pay,” wrote Jasay. But isn’t a little bit of redistribution necessary in any society? The state may take care of rent-seeking interest groups, but it also pays for roads, education and other public goods. True, but as Jasay explained, you can’t have one without the other. Any political system allowing the government to intercede in the economy will cause a bidding war between corporations and interest groups, which drives an increase in the amount of redistributed resources. Jasay wrote “The State” during the Thatcher and Reagan years, when the political winds blew against the idea of ever-bigger government. He acknowledged the existence of ideological differences but believed the structural momentum of a state was stronger than ideology. “Ideology,” Jasay remarked, “will sooner or later providentially issue the licence for precisely the sort of action which it is efficient for the state to undertake.” That is, the state always finds a way to justify its growth. Today, right-wing nativists and left-wing multiculturalists both court a stronger role for government. Restricting immigration means restricting economic activity—without the right papers, you’re out of a job. Offering special protections to special groups requires multiplying laws and enforcement mechanisms. 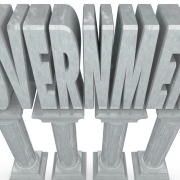 Neither side seriously and consistently argues for smaller government. Political realists like Jasay are often dismissed as Cassandras because they are passionate debunkers of all political delusions. But we won’t face up to our real political challenges without their reminders of what’s true. Mr. Mingardi is director general of Istituto Bruno Leoni, Italy’s free-market think tank, an adjunct scholar with the Cato Institute, and a scholar in political theory at Chapman University. Appeared in the February 5, 2019, print edition of WSJ. Do You Have Any Money? Prepare To Give It Up, Because It’s In The Wrong Hands: Yours. American politics is in part an eternal battle between those who prize freedom and those who demand equality, between the forces of income growth and those of income redistribution, and in 2019 the redistributors are on the march. 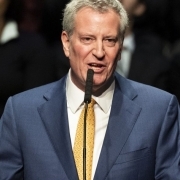 For the purest distillation of the socialist impulse, look no further than Mayor de Blasio’s statement of raw political purpose that we quote above from his annual address last week. Why is the party moving so far left? The mayor says New York’s—and America’s—money is “in the wrong hands,” and his duty is to put it in the right ones. The right hands are presumably his own, by which he can pass that money out to those he and the City Council believe to be more deserving. But when he says the “wrong hands,” who does he mean exactly? Who are these undeserving malefactors? Presumably he means the wealthy, so let’s mention a few of the New Yorkers he might have in mind. Perhaps he means David Koch, the retired businessman and libertarian who donated the entire $65 million cost for the new public plaza in front of the Metropolitan Museum of Art. The more than six million people who visit the museum each year can now stroll past trees and fountains on their way in and out of the Met, which by the way is also supported by private donors. Or perhaps the mayor is thinking of Ken Langone, the Home Depotfounder, who has donated hundreds of millions of dollars to the New York University Medical Center that treats patients of all incomes and social strata. Mr. Langone’s most recent $100 million gift, made last year, will go to provide cost-free tuition for every NYU medical student. Wrong hands? Or maybe the mayor has in mind Richard Gilder, who made a fortune in finance and provided the first major grant for the Central Park Conservancy that has rescued the park from its sad mid-20th-century decline. Each year the conservancy, led by private donors, restores eroding corners of this grand public space with new trees, lawns, playgrounds and ballfields that are used by tens of thousands across the city regardless of income. Mr. Gilder has also given generously to the American Museum of Natural History and the New-York Historical Society, two other favorites for visitors and students of all ways and means. Then again the mayor dislikes charter schools, so perhaps he means Stanley Druckenmiller, the legendary investor who has donated hundreds of millions of dollars for Geoffrey Canada’s successful charter-school network in the poorest neighborhoods of the city. These students would otherwise be stuck in failing schools run by Mr. de Blasio’s friends in the teachers union. But thanks to donations from Mr. Druckenmiller, and hedge-fund operator Dan Loeb’s gifts to the Success Academy charter network, thousands of kids have a shot at a better life. Here’s the real truth, brothers and sisters. Without the “wrong hands” that Mr. de Blasio despises, there would be no wealth or income to redistribute. Without the fruits of capitalist invention and business success, there would be no philanthropists to preserve the parks, to rebuild crumbling public spaces, to donate to the museums that give the non-rich a glimpse of great art and history, or to provide an alternative to failing public schools that cheat poor children of opportunity. The “Green New Deal”: Green Socialism Is Still Socialism. 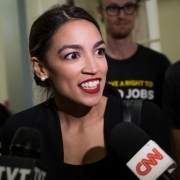 Upon taking control of the U.S. House of Representatives the first thing America’s Marxist Party did was to propose a Soviet-style, communistic destruction of American capitalism labeled a “Green New Deal.” The Party chose as its spokesperson for this totalitarian venture a young woman named Sandy Ocasio who grew up in one of the wealthiest enclaves in America, Westchester County, New York, but who decided to lie about this to get into politics by calling herself “Alex from the Bronx.” Sandy sounds like a poorly-educated-but-well-indoctrinated young communist with a ninth-grade mentality. She proudly labels herself a “democratic socialist” but as Ludwig von Mises explained, there really is no difference between communism and socialism: they are both attacks on private property and economic freedom. 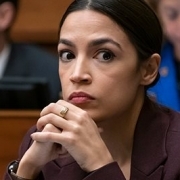 She seems clueless about just about everything she talks about in public, whether it is the Constitution, especially the economy, the structure of government, history, etc. This is the person the American Marxist Party has chosen as its front person in its proposal to destroy American capitalism, prosperity, and the American dream forever—and to give itself totalitarian control over virtually all aspects of American life. The first thing to understand about the proposed “Green New Deal” is that the first New Deal not only failed to end the Great Depression but made it more severe and longer-lasting. Its only “success” was in creating endless patronage opportunities and levers of political bribery and extortion for the Democratic Party, opportunities that the Republican Party happily embraced whenever it could to expand its own power and wealth in the succeeding decades. The proposed Green New Deal would do the same, only many orders of magnitude worse. At the outset of the Great Depression, 1929, the unemployment rate in America was 2.9% according to U.S. Dept. of Commerce statistics. Unemployment reached its peak in 1933 at 24.9%. There was a bit of a recovery as mal-investments were liquidated, but it only dropped the unemployment rate to 14.3% by 1939. It rose to 19.0% in 1938 and was still 14.6% in 1940, on the eve of American entry into World War II. Personal consumption expenditures were still lower in 1940 ($71.9 billion) than in 1929 ($78.9 billion). All of this despite eight years of unprecedented New Deal “stimulus spending,” regulating, controlling, subsidizing, lending, inflating, price-controlling, and taxing. The New Deal was an utter failure to the American people. Economists Richard Vedder and Lowell Gallaway estimated in their book, Out of Work, that the unemployment rate was eight percentage points higher in 1940 than it otherwise would have been without New Deal minimum-wage and pro-union legislation alone. Nor did World War II end the Great Depression. It ended high unemployment only because some 16 million men were sent overseas during the war. Sending a man to die in a foxhole in Germany is not the same as that man going to work in his own country and returning home to have dinner with his family every evening, contrary to Keynesian folklore about how the war supposedly “ended the Great Depression.” The average American family back at home was even worse off because of the massive diversion of resources from the consumer and business side of the economy to the government’s military infrastructure. The production of new automobiles and other products was made illegal, food was rationed, and everyone sacrificed even more. The Great Depression did not really end until after the war was over and the army was demobilized, returning billions of dollars of resources to the private sector. Federal government expenditures fell from $98.4 billion in 1945 to $33 billion in 1948. As a result, the year 1946 was the most prosperous year in all of American history in terms of the growth of the private components of GDP: private consumption and investment spending increased by 30% in that one year; no other year has ever been remotely close to that growth rate. Keynesian economists predicted another Great Depression because of the two-thirds reduction in federal spending while the exact opposite happened. That should have discredited Keynesianism forever, but the Washington establishment just ignored or lied about this fact, as it does to this very day. It took some seventy years, but the “mainstream” of the economics profession finally caught on to this truth, a truth that was recognized by Austrian School economists all along. In an August 2004 article in the prestigious Journal of Political Economy by Harold Cole and Lee Ohanian entitled “New Deal Policies and the Persistence of the Great Depression” the authors concluded that “New Deal . . . policies did not lift the economy out of the Depression . . . the abandonment of these policies coincided with the strong economic recovery of the 1940s” (emphasis added). Nevertheless, the New Deal was a political power bonanza for FDR and his fellow Democrats. According to a 1938 Official Report of the U.S. Senate Committee on Campaign Expenditures it was routine for the Roosevelt administration to demand that recipients of government make-work jobs, of which there were millions, register and vote as Democrats. As Jim Couch and William Shughart wrote in The Political Economy of the New Deal, “The distribution of the billions of dollars appropriated by Congress to prime the economic pump was guided less by considerations of economic need than by the forces of ordinary politics.” For example, the nation’s number one economic problem was the South, but since the South was solidly Democratic it received relatively little New Deal spending compared to other regions where FDR needed the votes. And, “The states that gave Franklin Roosevelt larger percentages of the popular vote in 1932 were rewarded with significantly more federal aid than less-supportive constituencies.” What else would anyone expect? American socialists have always searched for deceptive euphemisms for socialism with which to disguise their totalitarian plans for the rest of us. “Liberal,” “progressive,” “economic democracy,” “liberation theology,” “social justice,” and “industrial policy” are just a few examples. “Green New Deal” is the latest manifestation of this political con game. What has been proposed is nothing less than the destruction of the fossil-fuel-based energy industries which have long been the lifeblood of capitalism. All houses and businesses are to be “upgraded” in terms of their energy use by thousands, or tens of thousands, of government bureaucrats who would presumably go door to door to enforce the state’s energy-use mandates. There are vague promises of replacing the entire power grid with “renewable energy sources” such as windmills and solar panels. It all sounds very much like a middle-school paper assignment for an “environmental ethics” class. I would not be surprised to learn that Sandy Ocasio took such a class and wrote such a paper in the Westchester County public schools. The entire U.S. economy would be “planned” by a fifteen-member congressional committee, Soviet style. There is no acknowledgment at all of the failures of socialist planning everywhere else in the world; of the well-known economic reasons for these inherent failures; or of the fact that all the countries of the world that touted “planning” in the twentieth century have abandoned it, and for good reason. It is a recipe for turning America into a Third World economic hellhole, in other words, to be completed “in ten years” according to the published plan. Free-lunch economics pervades the plan, promising everyone a job and a “living wage” and of course, an end to economic inequality through ever more income redistribution schemes. But not to worry, say the Marxist planners, it will all be paid for by the Fed, a new system of “government banks,” and higher taxes. Simple. Thomas J. DiLorenzo is professor of economics at Loyola University, Maryland. This article first appeared at mises.org.